Trae Days: "No be small thing oh!" "No be small thing oh!" Two weeks in the villa "no be small thing oh!" I’m just glad that in the end I can say I was wiser for it; I paid my last respects and I gave my mum the befitting burial that she rightly deserved. Props to all who have had my back (via the internet, sms, calls, gifts, words, presence and deeds) over the past few weeks, I can't thank you enough, you made a brother feel loved. And talking about love, it's now official! After years of languishing in singledom and waiting on love I’ve got me a girl. It feels good to finally find someone who I can afford (to keep). 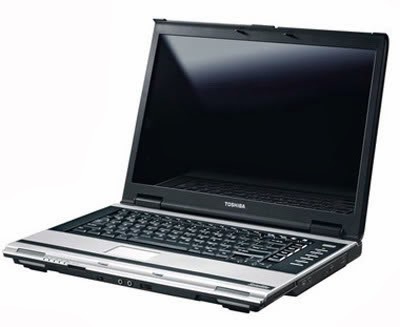 My new boo is a laptop, the Toshiba satellite A110-195! I’m still trying to get to know it better, do a little tweaking here and there and install one or two stuffs. I wish us many fruitful years together (I’m monogamist oriented, hope I don't have to get a second wife or upgrade too soon), and now just like Globacom I can truly rule my world! "No be small thing oh!" P/S: No be small thing oh! (Nigerian Pidgin English) = It’s not a small matter. The phrase is increasingly popular these days due to 2face Innocent Idibia’s extensive use of it in his new album (titled Grass 2 Grace). No be small thing o! :) Welcome back, man! And glad to hear everything went well. I wish I was there in person, sha. Btw, your gf is cute!!! I'm jealous. When do u go back to the base? Meanwyl, does the 'passing out' of the current corpers affect u in anyway? Hey trae no be small thing at all OOOOOOOOO !!!!!!!! right now im greeen with envy. this your gf is most definitely hawt!!!!. Glad to see your back on your feet again. And im glad that it all went well. Stay Strong and enjoy your new gf... just dont make the human one jealous. no be lie, that your laptop err gf no be small thing o! Glad to know u're back on your feet now! As per the bible and the existence of Jesus Christ, no be lie o! I have experienced Him too and i wish you will soonest experience Him too just as i have. No be small thing o! welcome back trae..it's been while..glad to see u blogging again...and ur g.f...hmmm..what can i say that hasn't been said..truly no be small things sha...i am jealous. You finally got a laptop! I remember that sometime last year you were longing for one. Congratulations. About being monogamous, I do not know if you would want to do that. Every month those guys release something new. I find myself changing my laptop every year! I just can't be faithful. @in my head and around: thanks, ten brownie points to you for remembering. well actualy you should cos it was about that time that i discovered you and i guess that was the first post you ever read off my blog. @the rest of my blog fam: thanks for sharing in my joy! but really i would have luvd 2 meet ya in abj but its all good u left d day i came in. and till we c again b d good person u always are. Hi Trae, sorry to hear your loss, i hope that you are ok now. RIP. Been reading your blog, very interesting, wow!! @qeniflex: nice rhyme bro, u amaze me all the time. but my my why the name change?! and why you're at that decipher "‘Eagleknife’ is Ugomma". @Vivian: sorry love, engineering wasn't my field and UNN is a really large school you know. anyways thanks for stopping by.